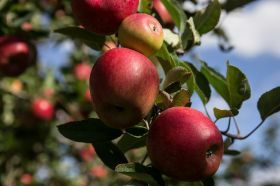 Near-perfect growing conditions on the continent brought about an unexpected bumper crop of four million apples in Poland this season, and this wrought havoc on the markets as oversupply lowered prices. With fruit being dumped in the field in September and October, the government stepped in to buy apples for processing at a fixed price of 0.35 zloty (7p) to assist growers. Dominik Woźniak, chief executive of Rajpol, says the ideal weather set up growers for a flush crop. “We had excellent conditions from the beginning, with no frost damage, spring frost, enough water, and a hot summer.” The initial discontent has given way since early autumn, however, as prices have risen back to more normal levels thanks to other countries opening their doors again to imports. Woźniak says that the oversupply was not a result of having too many orchards in the country, however, but rather from orchards simply bearing too much fruit – “we have had too many apples from an unexpectedly good crop.” Nor does he blame the ongoing Russian embargo on European produce, which initially hit Polish apple growers very hard. “I think after four years of this embargo it’s not a big influence,” he says. Orchard numbers in Poland have actually fallen in the past year due to tree maturation and orchards being taken out. Some growers have decided to convert their orchards into more profitable crops after an extended period of low apple prices. Poland’s apple orchards now stand at an estimated 176,000ha. He says that the Middle East and Europe will be the focus for their export strategy, with Spain, Germany, Scandinavia and Britain targeted as major opportunities. “We have quite competitive prices compared to Italy or France,” says Woźniak. One of the challenges for Polish growers, however, will be in producing better-quality fruit to rival their European counterparts. Woźniak says improving production methods will help, but so will “planting better varieties such as Royal Gala to replace some that are not as good such as Idared and Gloster”. Poland has not been immune to wider labour issues across European horticulture either, but unlike in Britain, access to labour is less pressing than the rise in costs. “Labour is more costly but still available – it now costs 20 per cent more than four years ago,” the Pole says.